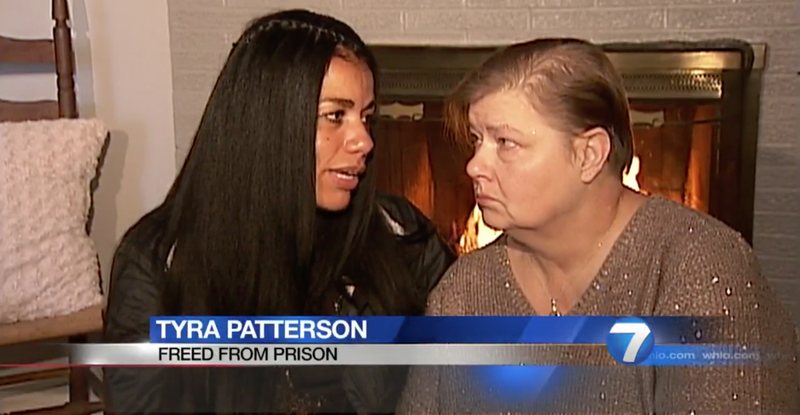 After 22 years in prison, an Ohio woman falsely accused of being an accomplice to murder at the age of 19 finally got to spend Christmas by her mother’s side. Tyra Patterson, a Dayton native, was sentenced to life in prison for robbing and murdering 15-year-old Michelle Lai in 1994. In Ohio, accomplices to murder can receive the same punishment as the actual killers, according to the Dayton Daily News. The last time she had set foot in her neighborhood was as a teenage girl. On Monday, Patterson was free on parole. Now 41 years old and flanked by television cameras, she held her mother once again for the first time in decades outside their home. Patterson maintained her innocence the entire time she was imprisoned, claiming that Dayton police coerced her into confessing to a robbery she didn’t commit. According to the Daily News, that robbery—over a necklace—opened her up to the aggravated-murder conviction. Now, thanks to a public campaign for her exoneration that brought in celebrities, politicians and the victim’s own sister, Patterson is free—though not exonerated. In fact, Michelle’s sister, Hollie Lai Holbrook, who was with her when she was killed, may have been the key to Patterson’s freedom. As the Dayton Daily News reports, Patterson was one of five people charged for the murder of Michelle and the robbery of Hollie Lai Holbrook and three other girls. According to court records, Michelle’s group had been out “rogueing”—stealing from garages—that day when they ran into Patterson’s group, which included Michelle’s killer, LaShawna Keeney. A Guardian article from 2016 lays out the complexities of the case. Patterson says that Dayton police forced her to admit that she had robbed a necklace from one of the girls—an act that would make her an active participant in the violent crimes committed against Michelle and her sister and friends. But Patterson never actually did so, she said. It turns out that Hollie Lai Holbrook, one of the victims, had claimed that Patterson was innocent as well. Last year, Lai Holbrook told The Guardian that, when Dayton police arrived at the scene of the crime, she singled out Patterson as someone who had nothing to do with her sister’s killing. “I remember pointing someone out that night and saying to the police: ‘She didn’t do it, she didn’t have anything to do with it’; that kept going around my head over and over again,” Lai Holbrook told the paper. Lai Holbrook, who was 18 at the time of her sister’s death, even provided a detailed description of Patterson: “She was biracial; dark, long hair. I recall she had a coat on, a fluffy coat,” she recalled telling police. But police convinced Lai Holbrook to believe that Patterson was involved after telling her that Patterson had confessed to robbing one of the girls. And that’s not the only way the state failed Patterson. As The Guardian recounts, not only was she forced to make a false admission to law enforcement, but the courts failed her, too. Patterson was inadequately represented at trial, with her defense attorney at the time telling the Guardian that his handling of the case was in his view the lowest point of his career as a lawyer. The defense team dissuaded Patterson from going into the witness box because she “spoke too hood” ... The trial defense team also decided to withhold from the jury a tape recording of a 911 call Patterson made to emergency workers soon after the murder happened. Six of the 12 members of the jury have given affidavits saying that if they had known about the 911 call they would have found her not guilty. Lai Holbrook, who wrote a letter to Ohio Gov. John Kasick last year advocating for Patterson’s exoneration, said that family pressure and trauma led her to bury her doubts about Patterson’s conviction for years. “I knew I was wrong. But I didn’t want to be the black sheep of the family, the odd one out, and I didn’t want to have to relive that night; I just wanted it buried,” Lai Holbrook admitted to The Guardian. On Christmas Day, Patterson and her family credited Lai Holbrook with reuniting them at last. “Holly Lai is a hero, and she has been an advocate for me,” Patterson said. Patterson, a sixth-grade dropout, will now work for the Ohio Justice and Policy Center in Cincinnati. Read more at the Dayton Daily News. Editor’s note: An earlier version of this story said Tyra Patterson had been exonerated. This was incorrect. She is currently free on parole, and the charges against her have not been cleared.